As with most pharaohs, Ramesses had a number of royal names. The two most important, his prenomen (regnal name) and nomen (birth name), are shown in Egyptian hieroglyphs above to the right. These names are transliterated as wsr-m3‘t-r‘–stp-n-r‘ r‘-ms-sw–mry-ỉ-mn, which is usually written as Usermaatra-setepenra Ramessu-meryamen. It translates as "Powerful one of Ma'at, the Justice of Ra is Powerful, chosen of Ra, Ra bore him, beloved of Amun." 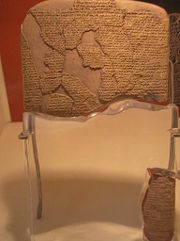 In the Hittite copy of the above-mentioned peace treaty with Hattusilis, the Pharaoh's name appears as Washmuaria Shatepnaria Riamashesha Maiamana. Some scholars believe this is possibly a closer approximation of the actual vocalization of the Egyptian king's name. In his Year 2, Ramesses II decisively defeated the Shardana or Sherden sea pirates who were wreaking havoc along Egypt's Mediterranean coast by attacking cargo-ladden vessels travelling the sea routes to Egypt. (Grimal 1992, 250–253) The Sherden people came from the coast of Ionia or southwest Turkey. Ramesses posted troops and ships at strategic points along the coast and patiently allowed the pirates to attack their prey before skillfully catching them by surprise in a sea battle and capturing them all in one fell swoop. (Tyldesley 2000, 53) Ramesses would soon incorporate these skilled mercenaries into his army where they were to play a pivotal role at the battle of Kadesh. As king, Ramesses II led several expeditions north into the lands east of the Mediterranean (the location of modern Israel, Lebanon, and Syria). This is an ancient festival dating back to pre-dynastic Egypt, though it was still popular at the time of Ramesses II. It was connected with the worshiping of the king and was carried out in the last month of the summer. (Seawright 2007) The festival was carried out by the king himself, followed by his wife, royal family, and court. When the king entered the sanctuary of the god Min, he brought offerings and burning incense. Then, the standing god was carried out of the temple on a shield carried by 22 priests. In front of the statue of the god there were also two small seated statues of the pharaoh. In front of the god Min there was a large ceremonial procession which included dancers and priests. In front of them was a king with a white bull that was wearing a solar disc between its horns. When the god arrived at the end of the procession, he was given sacrificial offerings from the pharaoh. At the end of the festival the pharaoh was given a bundle of cereal which symbolized fertility. Egypt's sphere of influence was now restricted to Canaan while Syria fell into Hittite hands. Over the ensuing years, Ramesses II would return to campaign against the Hittites and even achieved several spectacular victories (at a time of Hittite weakness due to a dispute over Muwatallis' succession) to briefly capture the cities of Tunip, where no Egyptian soldier had been seen since the time of Thutmose III almost 120 years previously, and even Kadesh in his Eighth and Ninth Years. (Grimal 1992, 256f) However, neither power could decisively defeat the other in battle. Consequently, in the Twenty-first Year of his reign (1258 B.C.E. ), Ramesses decided to conclude an agreement with the new Hittite king at Kadesh, Hattusili III, to end the conflict. The ensuing document is the earliest known peace treaty in world history. Ramesses II also campaigned south of the first cataract into Nubia. He constructed many impressive monuments, including the renowned archeological complex of Abu Simbel, and the mortuary temple known as the Ramesseum. It is said that there are more statues of him in existence than of any other Egyptian pharaoh, which is not surprising since he was the second-longest reigning Pharaoh of Egypt after Pepi II. Ramesses may have used art as a means of propaganda and his victories over foreigners are depicted on numerous temple reliefs. He also usurped many existing statues by inscribing his own cartouche on them. Many of these building projects date from his early years and it appears that there was considerable economic decline towards the end of his long 66-year reign. The colossal statue of Ramesses II was reconstructed and erected on Ramesses Square in Cairo in 1955. In August 2006, contractors moved the 3,200-year-old statue of him from Ramesses Square to save it from exhaust fumes that were causing the 83-ton statue to deteriorate. The statue was originally taken from a temple in Memphis. The new site will be located near the future Grand Egyptian Museum. In contrast to the buildings of other pharaohs, many of the monuments from the reign of Ramesses II are well preserved. There are accounts of his glory hewn on stone, statues, and remains of palaces and temples, most notably the Ramesseum in the western Thebes and the rock temples of Abu Simbel. He covered the land from the Delta to Nubia with buildings in a way no king before him had done. 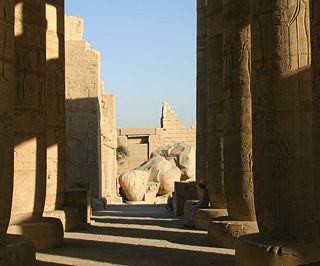 Ever since the nineteenth century, the temple complex, called Ramesseum, built by Ramesses II between Gurnah and the desert has been known by the name Ramesseum. The Greek historian Diodorus Siculo marveled at his gigantic and famous temple which is now no more than a few ruins. Oriented northwest and southeast, the temple itself was preceded by two courts. An enormous pylon stood before the first court, with the royal palace at the left and the gigantic statue of the king looming up at the back. Only fragments (measuring 17 meters high and weighing more than 1,000 tons) of the base and torso remain of the syenite statue of the enthroned pharaoh. The scenes of the great pharaoh and his army triumphing over the Hittite forces fleeing before Kadesh, represented in line with the canons of the "epic poem of Pentaur," can still be made out of the pylon. Remains of the second court include part of the internal facade of the pylon and a portion of the Osiride portico on the right. Scenes of war and the rout of the Hittites at Kadesh are repeated on the walls. In the upper registers, feast and honor of the phallic god Min, god of fertility. On the opposite side of the court the few Osiride pillars and columns still left can furnish an idea of the original grandeur. Scattered remains of the two statues of the seated king can also be seen, one in pink granite and the other in black granite, which once flanked the entrance to the temple. Thirty-nine out of the forty-eight columns in the great hypostyle hall (m 41x 31) still stand in the central rows. They are decorated with the usual scenes of the king before various gods. Part of the ceiling decorated with gold stars on a blue ground has also been preserved. The sons and daughters of Ramesses appear in the procession on the few walls left. The sanctuary was composed of three consecutive rooms, with eight columns and the tetrastyle cell. Part of the first room, with the ceiling decorated with astral scenes, and a few remnants of the second room are all that is left. Vast storerooms built with mud bricks stretched out around the temple. Traces of a school for scribes were found among the ruins. A temple of Seti I, of which nothing is now left but the foundations, once stood to the right of the hypostyle hall. It consisted of a peristyle court with two chapel shrines. The entire complex was enclosed in mud brick walls which started at the gigantic southeast pylon. The great temple of Ramesses II at Abu Simbel was discovered in 1813 by the famous Swiss Orientalist and traveler Ludwig Burckhardt, who is also credited with having found the city of Petra in Jordan. However, four years passed before anyone could enter the temple, because an enormous pile of sand almost completely covered the facade and its colossal statues, blocking the entrance way. This feat was achieved by the great Paduan explorer Giovanni Battista Belzoni, who managed to penetrate the interior on August 4, 1817. 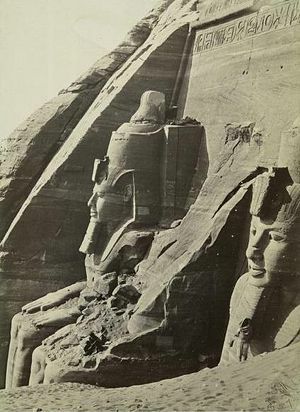 The Great Temple at Abu Simbel, which took about twenty years to build, was completed around Year 24 of the reign of Ramesses the Great (which corresponds to 1265 B.C.E.). It was dedicated to the gods Amun Ra, Ra Harakhti, and Ptah, as well as to the deified Ramesses himself. Four colossal 20-meter statues of the pharaoh with the double crown of Upper and Lower Egypt flank the entrance and decorate the facade of the temple which is 35 meters wide and is topped by a frieze with 22 baboons, worshippers of the sun. This latter is crowned by a bas relief representing two images of the king worshiping Ra Harakhti, whose statue stands in a large niche. The god is holding the hieroglyph user in his right hand and a feather (representing Maat, goddess of truth and justice) in his left; this is nothing less than a gigantic cryptogram for Ramesses II's throne name, User-Maat-Re. Next to the legs of the colossi there are other statues no higher than the knees of the pharaoh. These depict Nefertari, Ramesses's chief wife; the queen mother, Mut-Tuy; princes Amun-her-khepeshef and Ramesses; and princesses Bint-Anath, Nebttawi, and Merytamun. The temple is complex in structure and quite unusual because of many side chambers. The hypostyle hall (sometimes also called pronaos) is 18 meters long and 16.7 meters wide and is supported by eight huge Osirid pillars depicting the deified Ramesses linked to the god Osiris, the god of the Underworld, to indicate the everlasting nature of the pharaoh. The colossal statues along the left-hand wall bear the white crown of Upper Egypt, while those on the opposite side are wearing the double crown of Upper and Lower Egypt (pschent). The bas reliefs on the walls of the pronaos depict battle scenes in the military campaigns the ruler waged. Much of the sculpture is given to the Battle of Kadesh, on the Orontes river in present-day Syria, in which the Egyptian king fought against the Hittites. 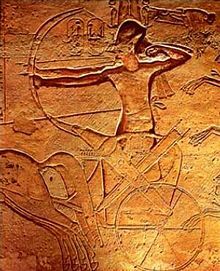 The most famous relief shows the king on his chariot shooting arrows against his fleeing enemies, who are being taken prisoners. From the hypostyle hall, one enters the second pillared hall, which has four pillars decorated with beautiful scenes of offerings to the gods. This hall gives access to a transverse vestibule in the middle of which is the entrance to the sanctuary. Here, on a black wall, are rock-cut sculptures of four seated figures: Ra Harakhti, the deified king Ramesses, and the gods Amun Ra and Ptah. Ra Harakhti, Amun Ra, and Ptah were the main divinities in that period and their cult centers were at Heliopolis, Thebes, and Memphis respectively. The axis of the temple was positioned by the ancient Egyptian architects so that twice a year—October 20 and February 20—the rays of sun worshiped by the 22 baboons would penetrate the sanctuary and illuminate the sculpture on the back wall, except for the statue of Ptah, the god connected with the Underworld, who always remained in darkness. It is quite logical to assume that these dates had some relation to a great event, such as the jubilee celebrating the thirtieth anniversary of the pharaoh's rule. In fact, according to calculations made on the basis of the heliacal rising of the star Sirius (Sothis) and inscriptions found by archaeologists, this date must have been October 22. This image of the king was enhanced and revitalized by the energy of the solar star, and the deified Ramesses the Great could take his place next to Amun Ra and Ra Harakhti. The temple of Hathor and Nefertari, also known as the Small Temple, was built about one hundred meters northeast of the temple of Ramesses II and was dedicated to the goddess Hathor and Ramesses II's chief consort, Nefertari. This was in fact the first time in ancient Egyptian history that a temple was dedicated to a queen. The rock-cut facade is decorated with two groups of colossi that are separated by the large gateway. The statues, slightly more than ten meters high, are of the king and his queen. On the other side of the portal are two statues of the king, wearing the white crown of Upper Egypt (south colossus) and the double crown (north colossus); these are flanked by statues of the queen and the king. What is truly surprising is that this is the only occurrence in Egyptian art that the statues of the king and his consort are equal in size. Traditionally, the statues of the queens stood next to those of the pharaoh, but were never taller than his knees. This exception to such a long-standing rule bears witness to the special importance attached to Nefertari by Ramesses, who went to Abu Simbel with his beloved wife in the Twenty-fourth Year of his reign. As in the Great Temple of the king, there are small statues of princes and princesses next to their parents. In this case they are positioned symmetrically: On the south side (at left as you face the gateway) are, from left to right, princes Meryatum and Meryre, princesses Merytamun and Henttawi, and princes Rahirwenemef and Amun-her-khepeshef, while on the north side the same figures are in reverse order. The plan of the Small Temple is a very simplified version of that of the Great Temple. As in the larger temple dedicated to the king, the hypostyle hall or pronaos is supported by six pillars; in this case, however, they are not Osirid pillars depicting the king, but are decorated with scenes with the queen playing the sinistrum (an instrument sacred to the goddess Hathor), together with the gods Horus, Khnum, Khonsu, and Thoth, and the goddesses Hathor, Isis, Maat, Mut of Asher, Satis, and Taweret; in one scene Ramesses is presenting flowers or burning incense. The capitals of the pillars bear the face of the goddess Hathor; this type of column is known as Hathoric. The bas reliefs in the pillared hall illustrate the deification of the king, the destruction of his enemies in the north and south (in these scenes the king is accompanied by his wife), and the queen making offerings to the goddesses Hathor and Mut. The hypostyle hall is followed by a vestibule, access to which is given by three large doors. On the south and the north walls of this chamber there are two graceful and poetic bas reliefs of the king and his consort presenting papyrus plants to Hathor, who is depicted as a cow on a boat sailing in a thicket of papyri. On the west wall, Ramesses II and Nefertari are making offerings to the god Horus and the divinities of the Cataracts—Satis, Anubis, and Khnum. The rock-cut sanctuary and the two side chambers are connected to the transverse vestibule and are aligned with the axis of the temple. The bas reliefs on the side walls of the small sanctuary represent scenes of offerings to various gods made either by the pharaoh or the queen. On the back wall, which lies to the west along the axis of the temple, there is a niche in which Hathor as a divine cow seems to be coming out of the mountain. The goddess is depicted as the mistress of the temple dedicated to her and to queen Nefertari, who is intimately linked to the goddess. Ramesses was buried in the Valley of the Kings on the western bank of Thebes, in KV7, but his mummy was later moved to the mummy cache at Deir el-Bahri, where it was found in 1881. In 1885 it was placed in Cairo's Egyptian Museum, where it remains as of 2007. Ramesses' mummy features a hooked nose and strong jaw, and is of above average height for an ancient Egyptian, standing some five feet, seven inches. (Tyldesley 2000, 14) He had red hair. In his last years, he suffered from arthritis, tooth cavities, and poor circulation. His successor was ultimately to be his thirteenth son, Merneptah. In 1974, Cairo Museum Egyptologists noticed that the mummy's condition was rapidly deteriorating. They decided to fly Ramesses II's mummy to Paris for examination. Ramesses II was issued an Egyptian passport that listed his occupation as "King (deceased)." According to a Discovery Channel documentary, the mummy was received at a Paris airport with the full military honors befitting a king. In Paris, Ramesses' mummy was diagnosed and treated for a fungal infection. During the examination, scientific analysis revealed battle wounds and old fractures, as well as the pharaoh's arthritis and poor circulation. 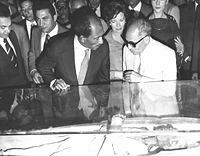 After Ramesses' mummy had been returned to Egypt, it was visited by the late President Anwar Sadat and his wife. The tomb of Nefertari, the most important and famous consort of Ramesses, was discovered by Ernesto Schiaparelli in 1904. 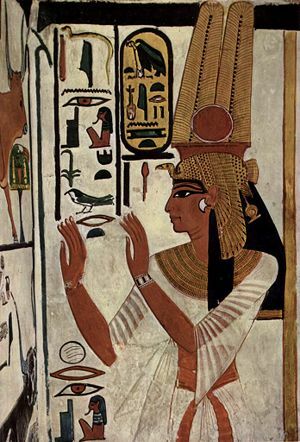 Although it had been looted in ancient times, the tomb of Nefertari is extremely important, because its magnificent painted wall decoration is surely to be regarded as one of the greatest achievements of ancient Egyptian art. A flight of steps cut out of the rock gives access to the antechamber, which is decorated with paintings based on Chapter 17 of the ''Book of the Dead''. The astronomical ceiling represents the heavens and is painted in dark blue, with a myriad of golden five-pointed stars. The east wall of the antechamber is interrupted by a large opening flanked by a representation of Osiris to the left and Anubis to the right; this in turn leads to the side chamber, decorated with offering scenes, preceded by a vestibule in which the paintings portray Nefertari being presented to the gods who welcome her. On the north wall of the antechamber is the stairway that goes down to the burial chamber. This latter is a vast quadrangular room encompassing about 90 square meters, the astronomical ceiling of which is supported by four pillars entirely covered with decorations. Originally, the queen's red granite sarcophagus lay in the middle of this chamber. According to religious doctrines of the time, it was in this chamber, which the ancient Egyptians called the "golden hall," that the regeneration of the deceased took place. The decorative pictogram of the walls in the burial chamber drew inspiration from chapters 144 and 146 of the Book of the Dead. In the left half of the chamber, there are passages from chapter 144 concerning the gates and doors of the kingdom of Osiris, their guardians, and the magic formulas that had to be uttered by the deceased in order to go past the doors. Ramesses II was not drowned in the Red Sea and the biblical account makes no specific claim that the pharaoh was with his army when they were "swept ... into the sea." (Exodus 14) In fact, Jewish tradition appears to indicate that the pharaoh was the only Egyptian to survive on that occasion, and later became the King of Nineveh in the Book of Jonah. There is nothing in the archaeological records from the time of his reign to confirm the existence of the Plagues of Egypt. This is not surprising since few pharaohs wished to record natural disasters or military defeats (as documented in the Biblical narratives) in the same manner that their rivals documented these events. In addition, no reference to any setbacks were made in royal Egyptian textual records or within the large number of informal Egyptian texts still in existence. For instance, after the serious Egyptian setback at the Battle of Kadesh, Hittite archives uncovered in Boghazkoy, the capital of Hatti, reveal that "a humiliated Ramesses [was] forced to retreat from Kadesh in ignominious defeat" and abandon the border provinces of Amurru and Upi to the control of his Hittite rival without the benefit of a formal truce. (Tyldesley 2000, 73) Benteshina, the ruler of Amurru who had been Ramesses' ally at Kadesh, was deposed and swiftly marched off to Boghazkoy to face an uncertain fate while the Hittite hold over Kadesh was reinforced. By contrast, in Ramesses II's version of events, the Pharaoh fictitiously states—just a day after his narrow escape from death in battle—that "the cowardly Hittite king sent a letter to the Egyptian camp pleading for peace. Negotiators were summoned and a truce was agreed, although Ramesses, still claiming an Egyptian victory…refused to sign a formal treaty. Ramesses returned home to enjoy his personal triumph, which was to be retold many times in prose, as an epic poem and in relief carving[s]." (Tyldesley 2000, 73) No inconvenient references to Ramesses' loss of Amurru or Upi are preserved in the Egyptian records. The dates now ascribed to Ramesses' reign by most modern scholars might not match the dates when Moses was believed to be in Egypt. In the 1960s and 1970s, several scholars such as George Mendenhall associated the Israelite's arrival in Canaan more closely with the Hapiru mentioned in the Amarna letters which date to the reign of Amenhotep III and Akhenaten and in the Hittite treaties with Ramesses II. Most scholars today, however, view the Hapiru instead as bandits who attacked the trade and royal caravans that travelled along the coastal roads of Canaan. On the other hand, Ramesses' own stele erected in the late thirteenth century B.C.E. in the city known to the Bible as Bet-Shan mentions two conquered peoples who came to "make obeisance to him" in his city of Ramesses but mentions neither the building of the city nor, as some have written, the Israelites or Hapiru. 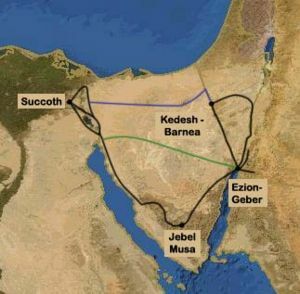 The Bible states that the Israelites toiled in slavery and built "for Pharaoh supply cities, Pithom and Ra'amses" in the Egyptian Delta. (Exodus 1:11) The latter is probably a reference to the city of Pi-Ramesse Aa-nakhtu or the "House of Ramesses, Great-of-Victories" (modern-day Qantir) which had been Seti I's summer retreat. (Tyldesley 2000, 82) Ramesses II greatly enlarged this city both as his principal northern capital and as an important forward base for his military campaigns into the Levant and his control over Canaan. According to Kenneth Kitchen, Pi-Ramesses was largely abandoned from c.1130 B.C.E. onwards; as was often the practice, later rulers removed much of the stone from the city to build the temples of their new capital, Tanis. (Kitchen 2003, 662) Therefore, if the identification of the city is correct, it strengthens the case for identifying Ramesses II as the Pharaoh who reigned over Egypt during Moses' lifetime. His son and successor, Merneptah, mentions in the so-called Merneptah Stele that the Ancient Israelites already lived in Canaan during his reign. Merneptah's reference to their destruction, according to Hasel, probably refers to the Egyptian military strategy of burning towns and their grain storehouses, instead of the destruction of the ethnic group which would either conflict with history or prove that Merneptah learned his propaganda tactics from his father. Merneptah's inscription uses parallel structures which contrast the Canaanite city-states with the Israelites. This prompts one to remember that the books of Joshua and Judges both paint pictures of the Israelites as tribes acting independently or in small coalitions against their enemies and wonder how fast they could have coalesced to the point where an ancient and mighty nation such as Egypt would consider them worth mentioning. 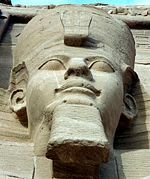 Speculation that Ramesses II was the Biblical Pharaoh named Shishak who attacked Judah and seized war bounty from Jerusalem in Year 5 of Rehoboam is untenable because both Ramesses II and his Nineteenth Dynasty successors (i.e., Merneptah, Seti II, Siptah, and Twosret) retained firm control over Canaan during their reigns. Neither Israel nor Judah could have existed as independent states during this time. Was Ramesses afflicted with megalomania, maybe vanity, or just sheer pride, perhaps even guilt that drove him to live up to the reputation of being a super human? Nobody knows the real answer, I'll let you come to your own conclusions, but there were eleven pharaohs who called themselves Ramesses, and only one was ever known as "Ramesses the Great." ↑ Dunn, Jimmy. "Ramesses II: Anatomy of a Pharaoh - An Introduction," TourEgypt Ramesses II: Anatomy of a Pharaoh-An Introduction. Retrieved September 6, 2007. ↑ "Giant Ramses Statue Gets New Home," BBC News, August 25, 2006 Giant Ramses Statue Gets New Home. Retrieved September 6, 2007. ↑ Alberto Siliotti, Egypt: Temples, people, gods, 1994. ↑ "Ramses II," ThinkQuest Ramses II. Retrieved September 6, 2007. ↑ "Valley of the Kings - KV5 tomb sons of Ramesses II - XIXth Dynasty," Valley of the Kings - KV5 tomb sons of Ramesses II - XIXth Dynasty. Retrieved September 6, 2007. ↑ G. Mendenhall, "The Hebrew Conquest of Palestine," Biblical Archaeologist 25 (1962). ↑ Stephen L. Caiger, "Archaeological Fact and Fancy," Biblical Archaeologist 9 (1946). ↑ Tony High, "The Life of Ramesses the Great," Egyptologyonline The Life of Ramesses the Great. Retrieved September 7, 2007. Ray, John. 2001. "Ramesses the Great," BBC, September 1 Ramesses the Great. Retrieved September 7, 2007. Seawright, Caroline. "Min, God of Fertility, Power and the Eastern Desert," Egyptology, Min, God of Fertility, Power and the Eastern Desert. Retrieved September 6, 2007. Hasel, Michael G. 1994. “Israel in the Merneptah Stela.” Bulletin of the American Schools of Oriental Research 296 (Nov.), pp. 45–61. List of Ramesses II's family members and state officials. This page was last modified on 25 June 2015, at 15:03.